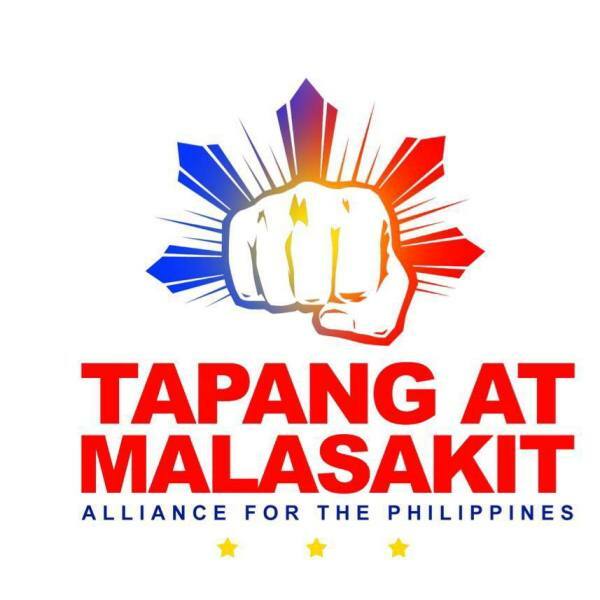 Tapang at Malasakit Alliance for the Philippines is an umbrella organization of groups that support the Duterte administration. It was launched on October 23, 2017 (Monday) with the leadership of Inday Sara Duterte-Carpio [Mayor of Davao City and daughter of President Rodrigo Duterte]. The launching was held at an events hall in Taguig City. "For the country, for the Filipinos. Support the President, support the government. Unite for our country. We are Tapang at Malasakit, a broad alliance of organizations in the Philippines and around the world who support President Rodrigo Duterte and his administration’s reform agenda. We pledged that we would be relentless in our commitment to become the government’s partners for change. Today, we stand together and unite our voices to reaffirm that commitment — not only to the government, but most importantly, to the Filipino people and to the country. Within a year of the Duterte Administration, we have seen significant reforms and accomplishments that can have a tremendous impact on the lives of the Filipinos, especially the poor. For instance, the administration’s social development policy includes free education program in state universities and colleges. The President has also ordered the swift rehabilitation of Typhoon Yolanda-affected areas. To address traffic problems and increase connectivity, the administration has embarked on an ambitious Build Build Build program to construct subway and railway systems, and more infrastructure around the Philippines. We see that overseas Filipino Workers have a special place in the heart of this government. The President recently approved the creation of the Overseas Filipino Bank, a policy bank dedicated to provide financial services for Filipinos working abroad. The government continues to intensely fight against corruption and criminality. These are the types of reforms that we support and we wish to continue. Recently, we have seen the liberation of Marawi through the counterterrorism efforts of the government. The killing of the terror leaders Isnilon Hapilon and Omar Maute exhibited the strong and decisive leadership of President Duterte in the face of numerous challenges. The Tapang at Malasakit Alliance for the Philippines stands behind the Duterte government in responding to the Marawi crisis. By freeing Marawi from terrorism, the government not only ensured the safety and security of Mindanao. It also clipped terrorism and prevented it from reaching Metro Manila or from spreading across the country. As a nation, we need to realize that the stability and peace in Mindanao is the stability and peace of the entire country. We call on the Filipino people to rally behind the government and support the cause against the threat of terrorism. At the same time, and this is very important, the Tapang at Malasakit Alliance for the Philippines rallies support for the government’s plan to rebuild and rehabilitate Marawi. We signify our unequivocal support to ensure that development reaches the intended communities and that crucial issues in the Mindanao region are addressed—poverty, lack of opportunities, inadequate infrastructure, and other elements that contribute to the growth of extremism and militancy. We enjoin all Filipinos to help the government succeed in its plans to improve the country. Let us not be distracted by the noise created by clashing political interests. We support freedom of speech and expression, but we need to recognize the difference between constructive criticisms and destructive politicking. To borrow the words of author and Australian Federal Member Andrew Leigh: “Extreme partisanship threatens the notion of politics as a communal conversation.” We can disagree without being individually disagreeable. Regardless of our individual opinions, we have to unite in solving issues that affect our everyday lives—such as corruption in government, poverty, lack of employment opportunities, traffic congestion, proliferation of drugs, criminality, threats to the environment, insufficient access to health and education. We each have the ability to proactively participate in improving our lives as Filipinos. We can consolidate our energies towards supporting our President, our government, our country, and each other. Whether you voted for President Duterte or not, let us cast our differences aside and work together towards a greater cause. We need to rebuild a better Marawi. We need to build a better Philippines. We are Tapang at Malasakit. We are partners for change. Let us all become partners for change." "I call on President Duterte supporters to unite and all those who want to join us now, let us work to make change happen. Let's start by continuing to fight global terrorism by quickly rebuilding Marawi, focus on our poverty that has fueled narco-politicians, set aside our personal politics that has torn our country every time we have a new President."